The "What's New?" Dragon (also known as the Mauve Dragon, or the Big Pain in the Expletive Deleted) is a rare creature indeed in the AD&D® game world. Because of its characteristics and general behaviour, however, it is not much missed. It stands roughly waist high and resembles a short, light purple, fire-breathing dragon, with the head of a cow wearing a puzzled expression. According to legend, the "What's New?" Dragon was created when a drunken arch-mage attempted to crossbreed a red dragon, a blue dragon, a cow, and a small terrier dog he had handy, "Just to show 'em!" The resulting animal (using the term loosely) promptly torched the wizard's lab and flew away. The arch-mage later gave up magic and drinking, as well as a few other vices he was indulging in at the time, and became a hermit monk. The "What's New?" Dragon, named for some pages in an ancient tome that first described the beast, does not have a lair. The chance of catching it while it is asleep or unawares is so low that players could just as well throw their dice off the table rather than try to roll for it. Instead, the dragon will simply wander onto the scene at the DM's discretion and investigate any loud noises, such as those made by the average party of adventurers in chain mail and plate mail armour. Upon arrival, the dragon will announce its presence by voicing its call, "Growf!" (pronounced "growf" or "growph"). This could mean many things, since it is the only word in the dragon's language. This call will be repeated for 1-6 rounds, after which (unless somebody answers the call with another "Growf!") the dragon will use its breath weapon on whatever targets are handy. Magical items are allowed a saving throw vs. magical fire. Metallic items will not burn, but non-magical metals will automatically melt into slag (again, without harm coming to anyone touched by it). Once the breath ends, the metal will have magically cooled so that, while hot to the touch, it will not cause injuries. Getting out of a suit of melted plate mail, however, could prove difficult without a can opener. Despite its annoying habits, lack of intelligence, and homeliness, the "What's New?" Dragon has one peculiar ability that allows it to survive all it meets. It is able to invoke a condition known as "DM's Grace" an annoying streak of unkillability brought about by incredible twists of fate and a snickering DM. Spells cast at the dragon are dispelled mere inches away from it, weapons miss it no matter how skilled the wielder is, and thieves always step on a squeaky board when creeping up on it (even in the outdoors). After about ten minutes of this nonsense, the dragon will get tired of the party and leave. The worst thing that characters can do is to submerge the "What's New?" Dragon in water, for it will then appear to multiply in number as if a mirror image spell had been cast upon it. The "images" are real, however, and the dragon will produce multiples of itself at a rate of 1-4 per round for the duration it is kept in water. Splashing water upon it will automatically produce 1-4 multiples of the dragon, all of them identical to the original. Watering a "What's New?" Dragon is considered a felony in most kingdoms, punishable by being made to swim a froghemoth's pond armed with a putty knife. No experience will be gained from attacking a "What's New?" Dragon, and those who try it should have their wrists slapped by a fire giant. Note that the stats above are of course for AD&D First Edition! Ah... those were the days... Give me my THAC0 determination wheel and let's do some exploring of that Keep on the Borderlands! 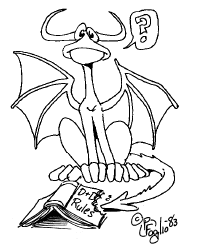 Winslow and most other images are Copyright © by Phil Foglio, and are used without permission. Other cover art Copyright © by their respective publishers. The rest are my own, or AFAIK in the public domain. Got a problem viewing this page? Click here. Totally lost? Click here.